I’ve had this wine several times in the past. You can read my review of the 2005 vintage here. I’ve also purchased it many times and not written about it since it was always the 2005 I found in stores. 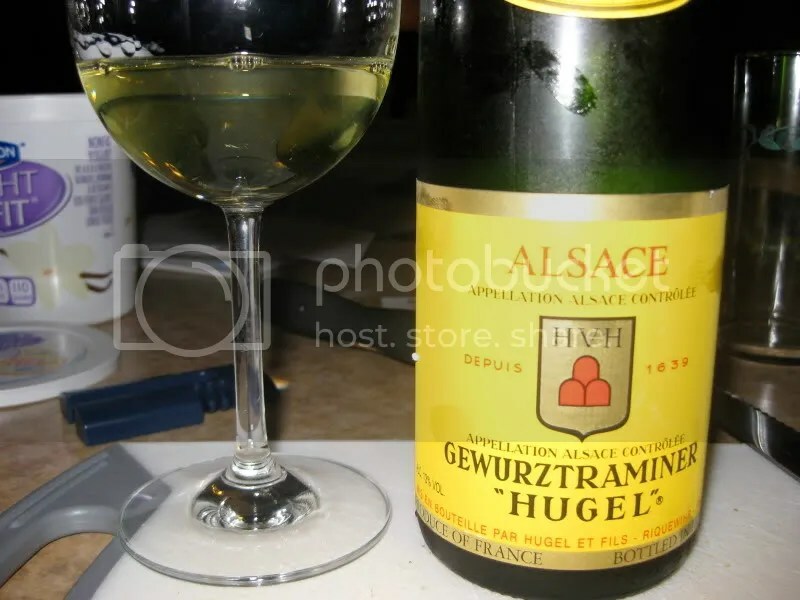 Here we have the 2007 Hugel Gewurztraminer “Hugel.” At around $18 this is one of my steady go to white wines for character and reliability. It clocks in at 13% alcohol by volume and has a Diam closure. On the nose I got white flowers, lychee, spice, peach, tropical notes, star fruit, white pepper, and lemon. This has always been one of those wines with a nose I just want to bottle and carry around with me. In the mouth I found lychee, orange citrus, mandarins, nectarines, bananas, lemon, tropical fruit, and star fruit. Basically a whole fruit bowl in a glass. 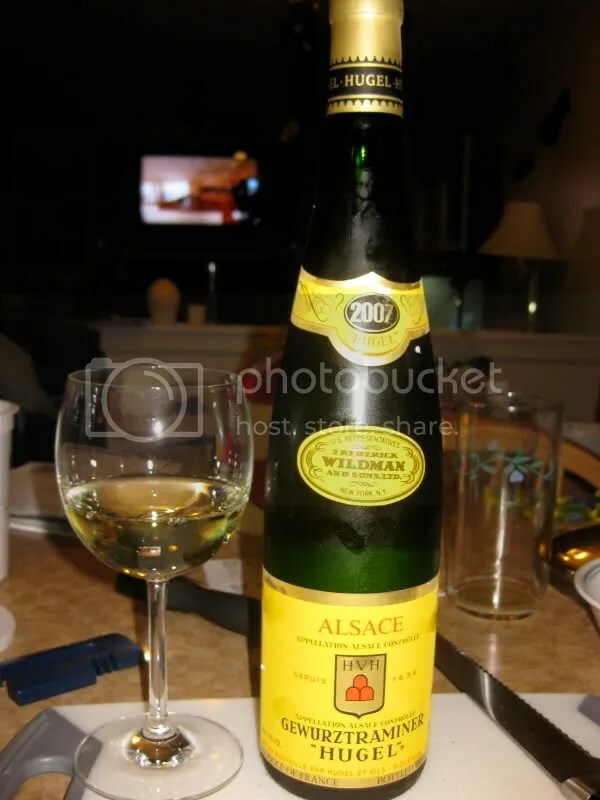 The wine had that great oily mouthfeel quality that I sometimes find in Gewurztraminers and Vigonier. The 2007 definitely deserves a place on your holiday table. 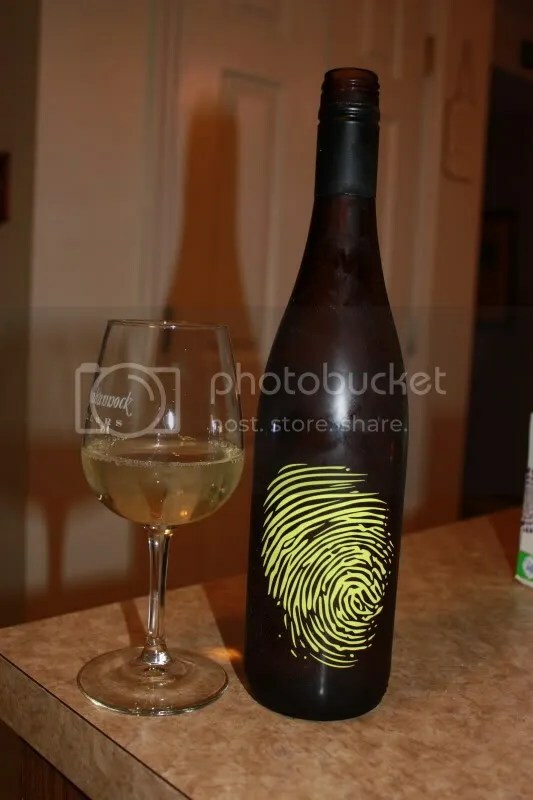 *Disclaimer: I received this wine as a sample from Spy Valley Winery. 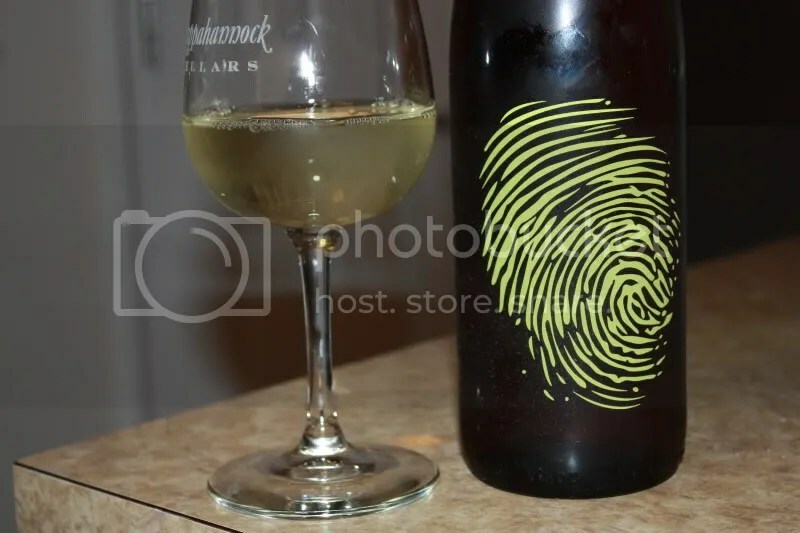 Well, if you were sitting in my living room, it would be a bottle of the 2007 Spy Valley Gewurztraminer! This is the 4th in a series of wines I’ve sampled from the Spy Valley line, which arrived here about 3 week ago. Following along with the others, I also really enjoyed the Gewurztaminer. We had it after dinner the other night, though I snuck outside to snap my photos as I couldn’t get the lighting in the house right to capture the label. Too much flash! The Spy Valley Gewurztraminer had a screw cap closure, looks to retail for somewhere around $16, and clocked in at 13.5% alcohol by volume. On the nose I found spice, lychee, mandarin oranges, lemon, flowers, honeysuckle, a touch of cracked pepper, and jasmine. This wine had the kind of nose you just want to keep sniffing forever. In the mouth I got flavors of spicy pear, lemon, honey, yellow apple, and tangerine. The mouthfeel seemed a touch oily, but the fruit showed as quite clean. We both enjoyed this bottle. 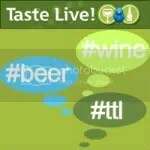 Filed under: Gewurztraminer, New Zealand, White, Wine |	Comments Off on What Do You Spy? *Disclaimer: I received this wine as a sample from Mill Creek Winery. Tonight I felt like a spicy white wine. Our weather is hot hot hot! And white wine is just the ticket for nights like tonight. 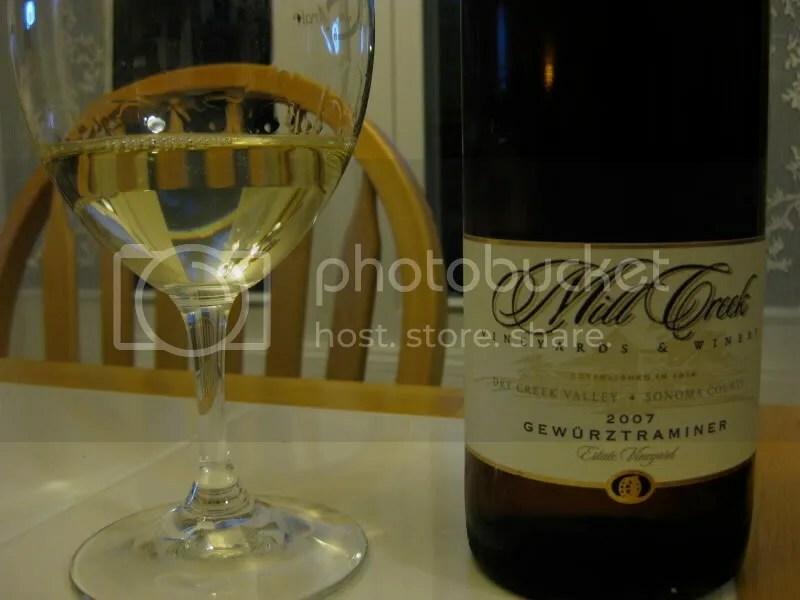 I picked the 2007 Mill Creek Winery Gewurztraminer out of the basement to sip after dinner. 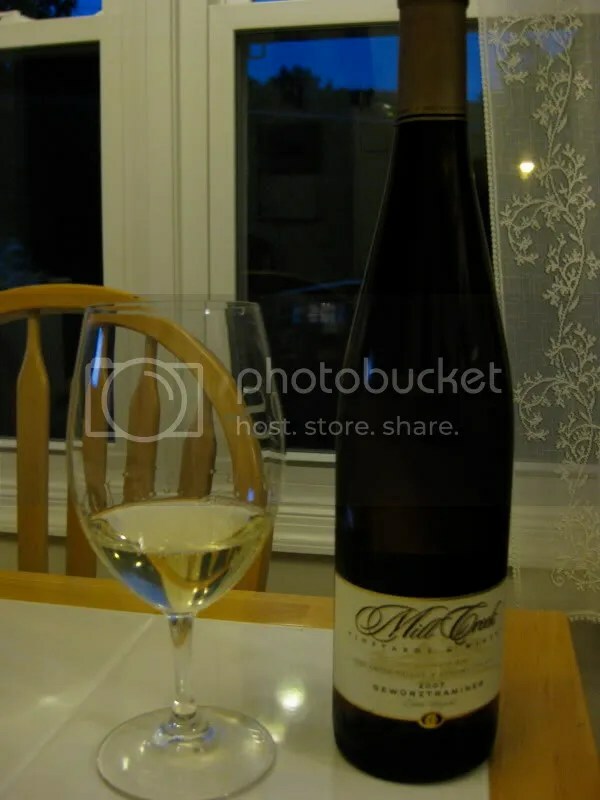 We had leftover meatloaf and I didn’t think the wine and and the meatloaf would work so well together….this is my second Mill Creek Winery wine and I’m digging them! The Gewurztraminer (I have such trouble spelling that grape!) clocked in at 14.1% alcohol by volume, had a real cork closure, and retails for $18. On the nose I find white flowers, spice, lychee, almonds, spicy pears, lots of flowers, the slightest hint of tangerine, and a touch of honey. I love the nose on Gewurztraminer. I could have kept smelling this one for hours, but Matt was eyeing my glass, so I thought I best get to it! In the mouth, the wine is crisp with a great spciy characteristic. I get the tangerine more in the mouth, with lychee, flowers, almonds, and exotic spices. 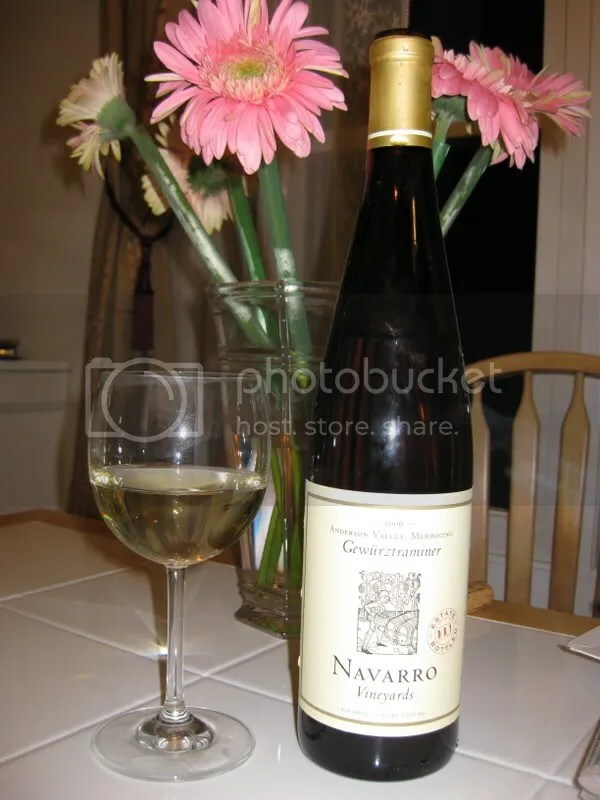 This is a tasty Gewurztraminer, and if you are so inclined to eat spicy foods, this would make a great match! So on the first day of the Wine Blogger Conference, not only did we have the Kick Ranch Tasting, the “speed dating” tasting, and the Dry Creek Growers tasting, we also were treated to a grand tasting of New Zealand wines sponosred by the New Zealand Wine Growers Association. This is actually the 2nd time I’ve had the pleasure of tasting the wines of the New Zealand Wine Growers Association, the first time was at the DC International Wine and Food Festival. The New Zealand folks brought over 100 wines for us to taste, ranging from the typical Sauvignon Blancs and Pinot Noirs, to Pinot Gris and Gewurztraminer. 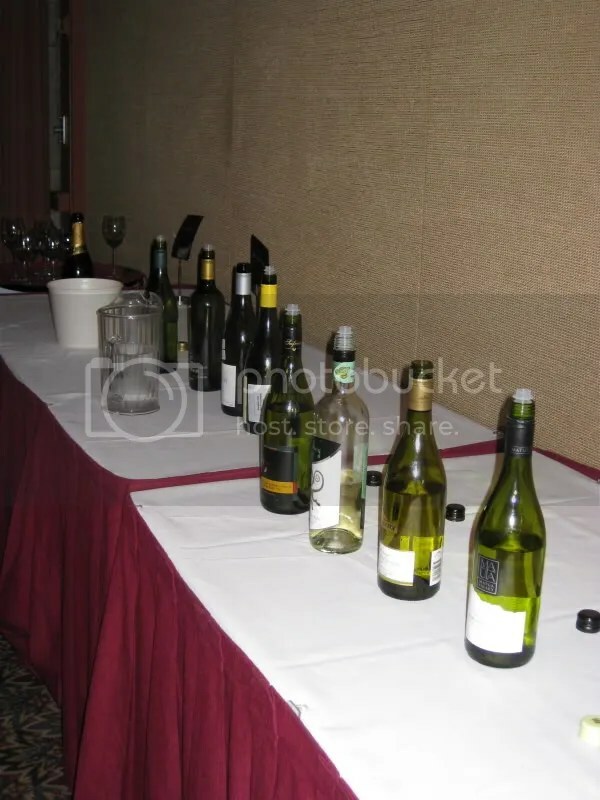 I think this was one of the more popular tastings at the Conference, as you could pour everything yourself, meander around at your leisure, and you were able to relax and mingle with the conference participants in an open format. Now, with over 100 wines, and only an hour to taste, I honestly didn’t get through very many. But I really enjoyed the one I did! 2008 Crossroads Marlborough Sauvignon Blanc: Grapefruit, gooseberry, all citrus, tart, not bracing. Very nice. 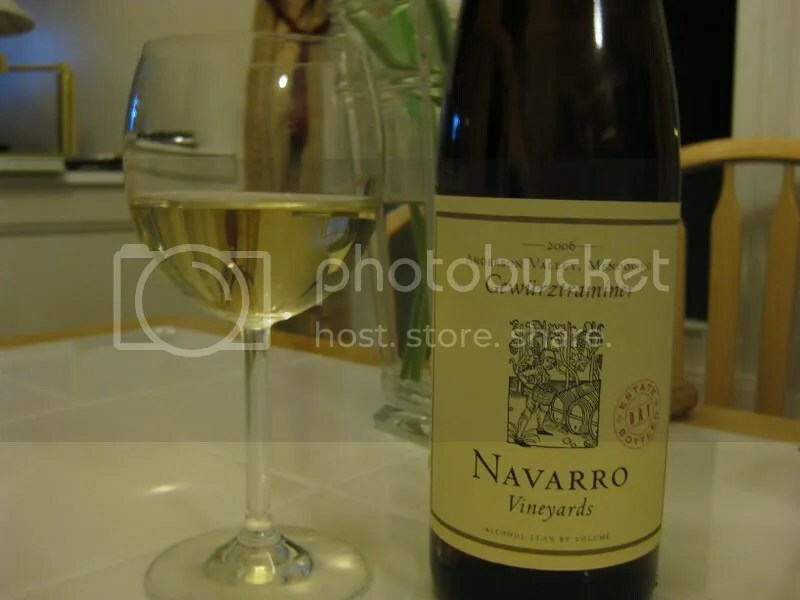 2008 Vavasour Awatere Valley Sauvignon Blanc: Jalapeno, gooseberries, bracing, tart, really tart. 2008 Care Campbell Marlborough Sauvignon Blanc: Grapefruit, lemon sherbet, green pepper, asparagus, tart. 2008 Mount Grey Estate Waipara Pinot Gris: Pear, tinned pear, banana, lemon, cooked pear, nice acidity. 2007 Staete Landt Marlborough Pinot Gris: Honeysuckle, pear, peach, crisp, nice acidity. Excellent. 2007 Seifried Gewurztraminer: Oak, pear, peppers, flowers, pear, peach, almond. Very nice. 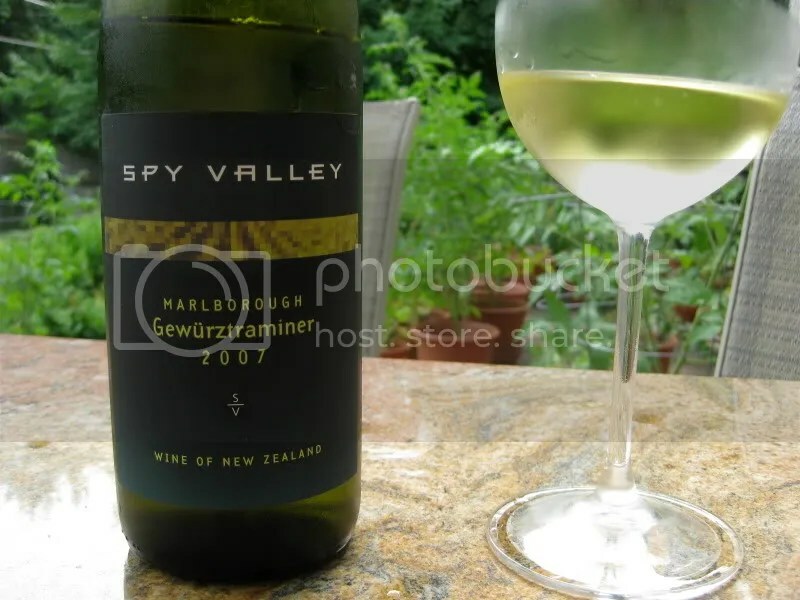 2008 Spy Valley Gewurztraminer: Really expressive nose, lychee, flowers, pears, honesuckle, crisp, tart, pear. Extremely well done. 2008 Omaka Springs Sauvignon Blanc: Light nose, gooseberry, citrus, pepper, slight lemon, tart, very nice. I didn’t get anywhere near the reds, sadly. I wish I had the time to, as I don’t think I’ve ever had a red wine from New Zealand. I heard lots of good feedback from other folks on the quality of the Pinot Noirs. However, having just come off an all Zinfandel tasting, I was really feeling the white wines and the Sauvignon Blancs (as we all know, I love New Zealand Sauvignon Blanc) really hit the spot.